These loudspeakers only look like they came from a '70s catalog. 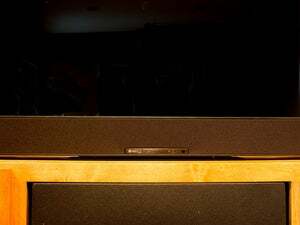 This is an in-depth review of Berlin Acoustic’s Raumfeld Stereo M bookshelf speakers. If you want to know more about the entire Raumfeld wireless audio system in depth, start with our introductory article that explores the entire ecosystem and how it operates. 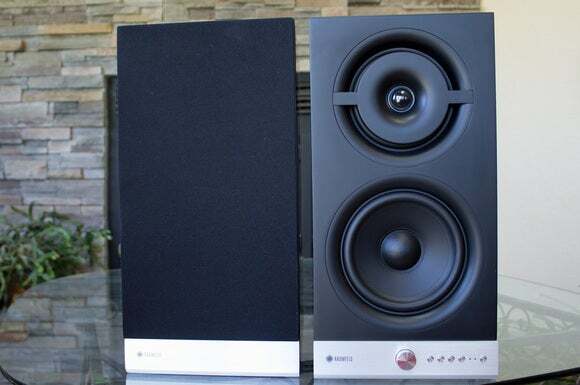 Raumfeld’s Stereo M wireless bookshelf speakers only look like traditional speakers. While their retro design evokes stereo ads from the 1970s, the hardware inside the cabinet is all 21st-century, starting with a Wi-Fi adapter that connects either to your wireless network or to a proprietary network anchored by the Raumfeld Expand. Don’t be taken aback by this system’s $1,299 price tag: It’s not that much more than a pair of Sonos Play:5 speakers ($499 each at Amazon) if you were to buy two and configure them as left/right channels. The difference is that you can run a single Sonos Play:5 in stereo mode, where the Raumfeld speakers can operate only as a stereo pair. The guts of the Stereo M speaker system are in the left channel, but you can tweak the firmware so that you can position the master speaker to be on the right, which is how I tested it (being right-handed, that felt more natural to me). 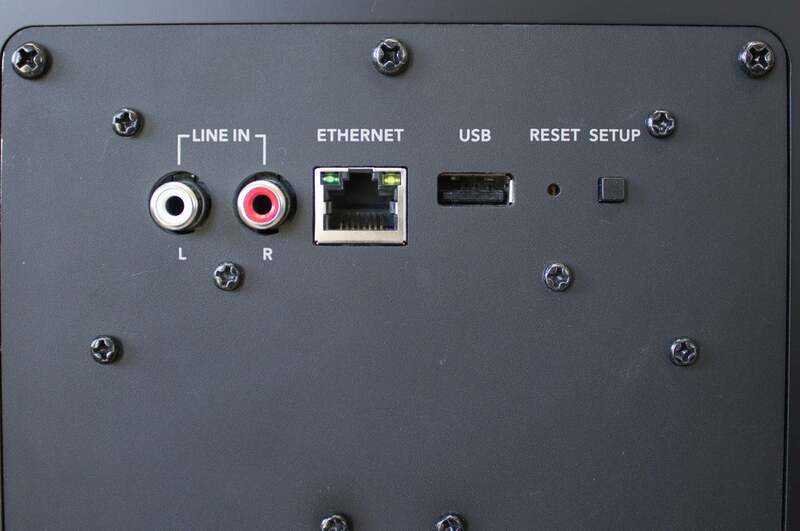 Whichever way you set them up, you’ll need to connect the two speakers using the generous 18 feet of speaker cable that comes in the box. The cable is partially pre-stripped; you just need to give the insulation a tug to pull it off. The speakers have beefy five-way binding posts, but you’ll want to install banana plugs (my choice), spades, or whatever your favorite speaker connector might be to ensure the cables make solid contact with the speakers. 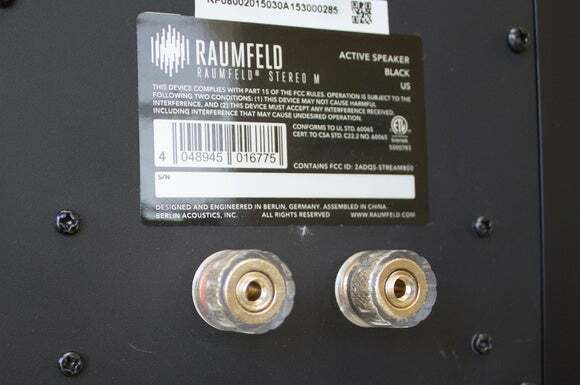 The Raumfeld Stereo M bookshelf speakers have analog RCA inputs and an RJ-45 ethernet port, but most people will use their wireless connectivity. The master speaker has analog stereo RCA inputs, a USB port, and an RJ-45 port for hardwired ethernet connections, but you’ll likely use the speaker in wireless mode, and that’s how I tested it. This is a fully three-way speaker system, with 0.98-inch fabric dome tweeters mounted in front of 4.3-inch coated cellulous mid-ranges in a coaxial arrangement in each cabinet. There are 5.5-inch polypropylene woofers beneath those two units. The speakers are driven by a 140-watt (RMS) Class D amplifier housed in the master speaker (there’s an old-fashioned volume-control knob on this speaker as well). Berlin Acoustics does offer a wireless subwoofer, but it can’t be paired with these bookshelf speakers. The drivers are housed in very traditional-looking MDF cabinets with an elegant matte-black lacquer finish. There’s a rear bass vent at the top of the cabinet, and cloth grills attach to the front via magnets. Threaded mounts on the bottoms of the cabinets mate to optional steel-and-brushed-aluminum floor stands ($299, available at Amazon). 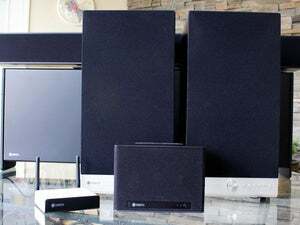 There is no accommodation for hanging the speakers, though, so you’d need something custom and very beefy if you decided to mount them to the wall: The master speaker weighs more than 25 pounds, and the passive satellite weighs just over 23 pounds. 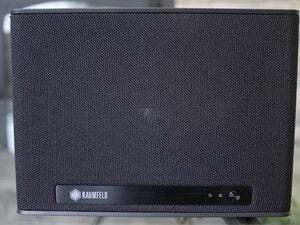 The Raumfeld WiFi Soundbar and subwoofer present the most bang for the buck in the Berlin Acoustics multi-room audio system, but the Raumfeld Stereo M speakers offer up the best audio by far. They supplied balanced performances with all types of music, ranging from the jazz/rock of Steely Dan to the alternative folk of the Welsh band 9Bach. On Steely Dan’s “Jack of Speed,” from the band’s Two Against Nature CD (ripped and encoded in 16/44.1 FLAC), the tweeters reproduced the snap of the ultra-tight snare drum with authority without losing track of the midrange of the tightly synchronized horns backing the band. The speakers produce the kind of stereo separation that single-cabinet speakers can only dream of, while also creating a generously wide sweet spot. The Stereo M is a wireless system, but one of its speakers depends on the amplifier in the master. The connection is made using these robust binding posts. The Stereo M presented 9Bach lead singer Lisa Jen’s lilting vocals on “Wedi Torri,” from the band’s second album Tincian, with absolute clarity without burying the delicate acoustic guitar and Welsh harp backing her. (I acquired this track from Bowers & Wilkins’ Society of Sound music service, encoded as a 24/96 FLAC file) As the drummer ramps up, and Jen takes a pair of soft mallets to a tom-tom during the song’s climax, I could feel the bass resonate in my chest. The Stereo M is an excellent speaker system, and its bass performance somewhat makes up for the fact that you can’t pair the Raumfeld subwoofer with it. But it doesn’t change the fact that Sonos has the better multi-room audio system overall, even if the Stereo M sounds better. Sonos has the better wireless multi-room audio system overall, but these bookshelf speakers outperform a pair of Sonos Play:5s set up as a stereo pair.